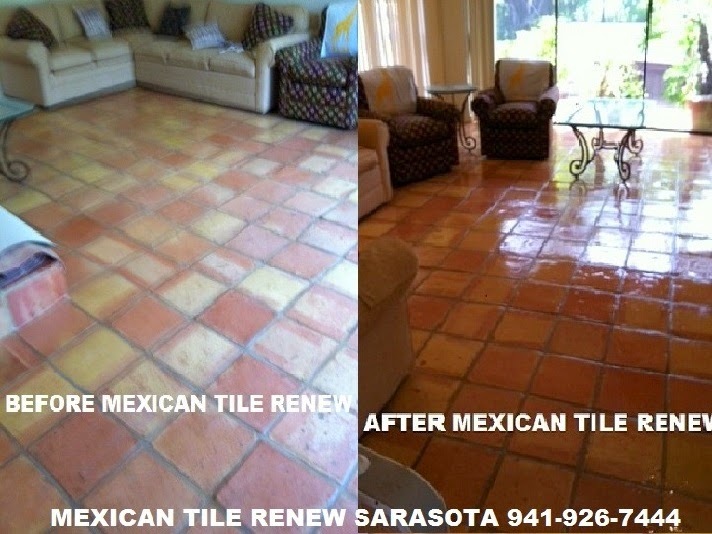 ﻿Mexican Tile Restoration - Saltillo Tile Restoration ﻿Sarasota Florida. 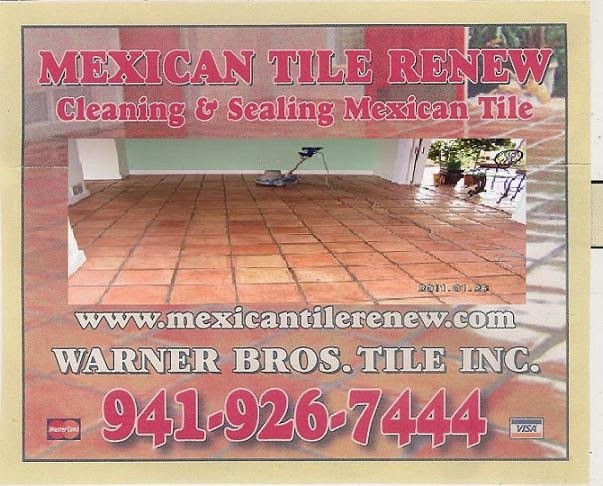 Best Prices on Mexican 'Saltillo' Tile Cleaning in Florida. 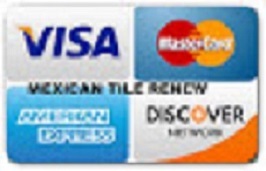 We have completed over 2,500 Tile renovation projects. 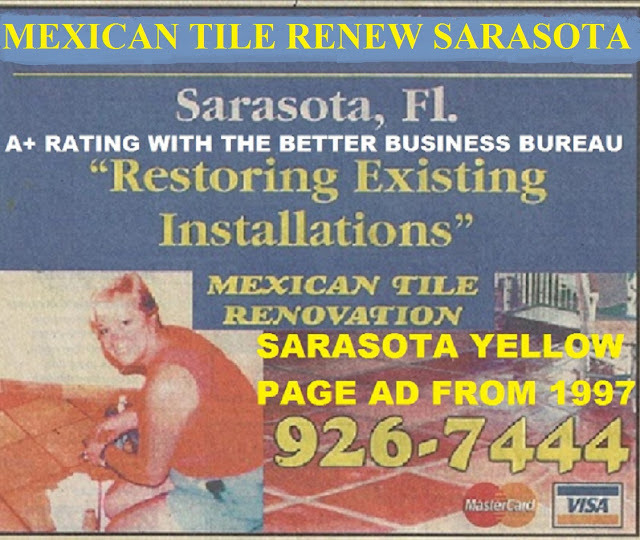 We started our Mexican Tile refinishing business in Panama City Fl in 1995 over 22 years ago, now in Sarasota Fl. 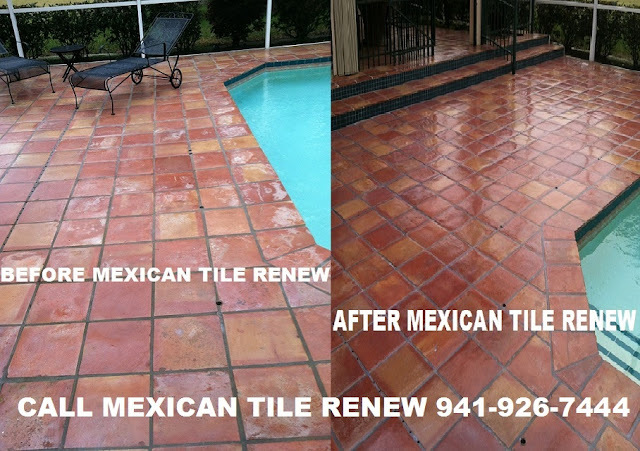 Mexican Tile Restoration - Saltillo Tile Restoration Efflorescence, the white spots seen on Mexican tile, comes from the back of the tile not from the top of the tile. Efflorescence is a white crystalline deposit that is composed of salts, lime and/or other minerals, see example photo above. These deposits may become visible on many types of building surfaces such as concrete, stucco, grout, masonry, brick, natural stone, clay, ceramic tile, Mexican tile and even wood. 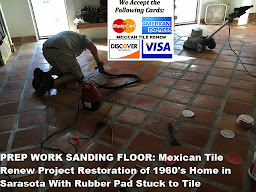 These salts and minerals are water-soluble and generally come from the ground up or where alkali substances exist (thin set motor used to set Mexican tile). 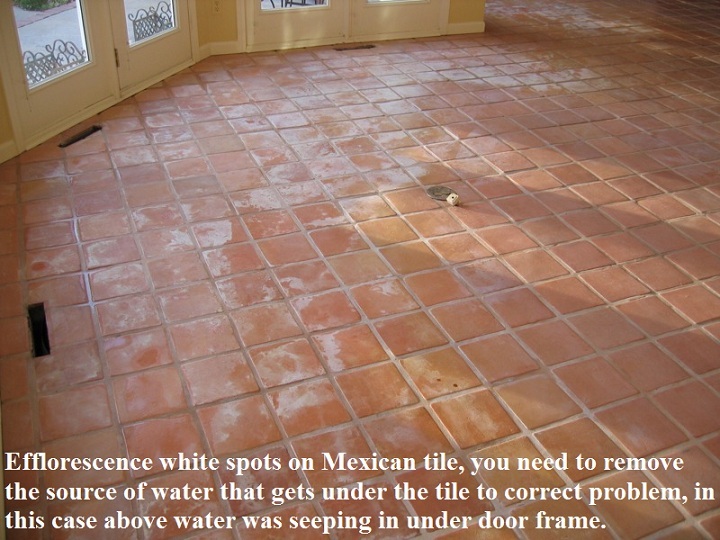 You need to remove the source of water that gets under the tile to correct the problem. If efflorescence exists on an installed surface then strip off the sealer and rinse with an acidic cleaner, rince with clean water, dry out and reseal. These salts and minerals are reactive to most acidic cleaners and will usually dissolve upon contact. Moisture migration follows the path of least resistance. 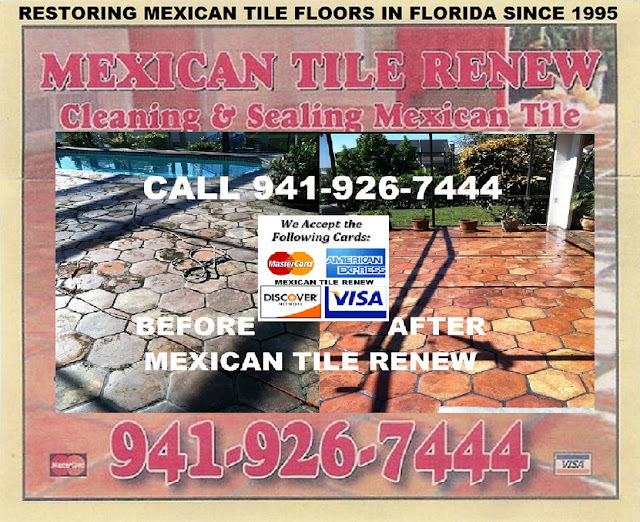 Therefore, with dense surfaces such as ceramic tile, it is often found that the grout lines are more vulnerable to show efflorescence due to the higher concentrations of these deposits in those areas. 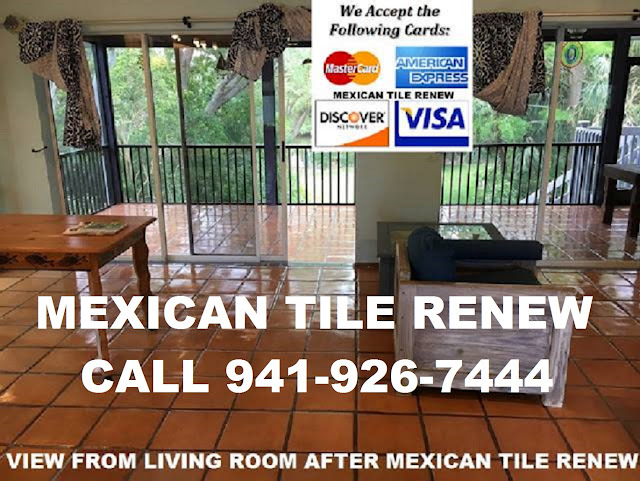 On the other hand, Saltillo tile or Mexican tile is porous enough that moisture transmission and salt or mineral deposits can be seen throughout the entire surface. Mexican Tile Renew ﻿Clean and Seal Fort Myers to Sarasota To St Pete Fl. 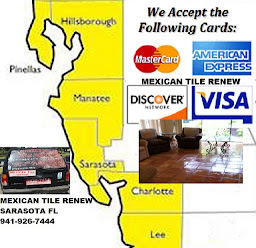 Florida Mexican Tile Restoration, JANUARY 3rd 2015, OUR 20th YEAR IN BUSINESS. Never "Steam Clean" Mexican tile floors or use vinegar. 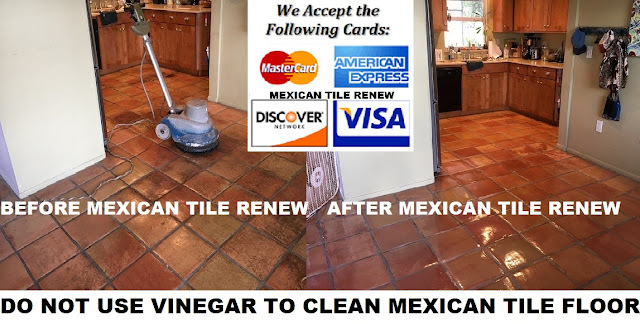 MEXICAN TILE WE STRIP, CLEAN & SEAL.